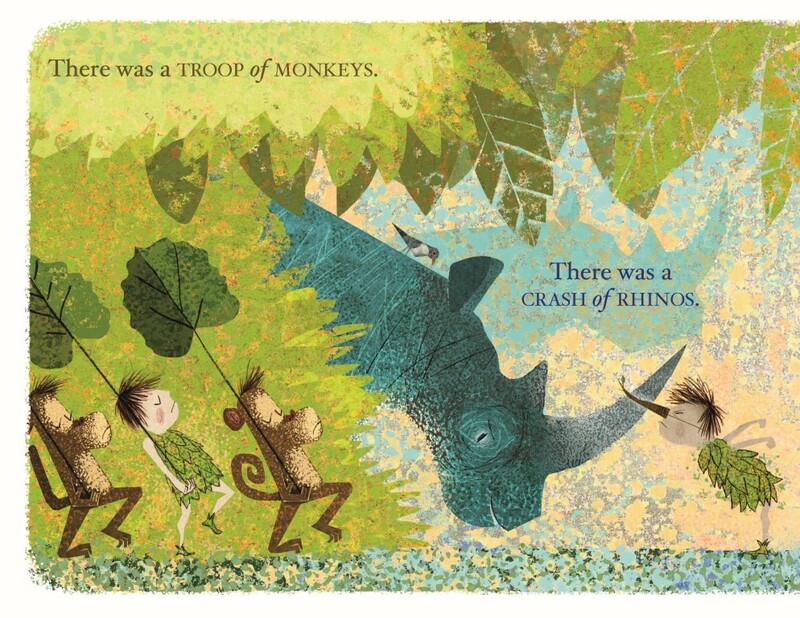 Two-time Caldecott Honor artist Lane Smith (The Stinky Cheese Man; Grandpa Green) has created a whole universe within the covers of There Is a Tribe of Kids--a playful, profoundly beautiful universe in which everyone wants to find a home. The story--a boy's solo odyssey through the natural world--begins with his happy discovery of some baby goats: "There was a TRIBE of KIDS," says the only line of text on this spread... rather insistently, given all those capital letters. Some of the narrative unfurls in wordless comic strip-style panels, such as in the opening scene where, in an expressive triptych 1) the boy hugs one of four goats 2) the goats climb the precipice behind him and 3) the last goat has disappeared out of the picture completely, leaving the boy to gaze forlornly up at their trail from below. These wordless frames are the heart of this lovely picture book, and they often express the joy of interaction between the boy and his new animal friends, followed by a quiet sense of loneliness when they part ways. Smith's appealing and kid-friendly--yet artfully stylized and elegantly hip--artwork blossoms more and more with each reading. The medium is described as "painted in oils and sprayed with an acrylic varnish to create various mottled textures," with colored pencils, graphite and both traditional and digital cut-and-paste techniques. That sounds like a labor of love, maybe a gloriously messy one, and the snowy texture and depth of it translate gorgeously to the page. Just as the boy is leaving the sadly goat-less precipice, he spots a penguin. 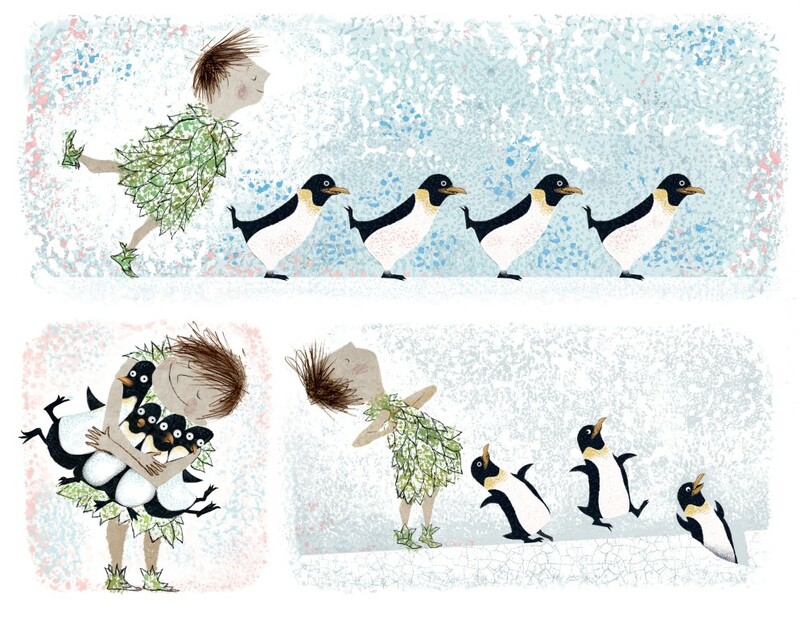 Turn the page and the boy is skating merrily on ice with four penguins, then hugging all of them at once (he's a hugger! ), then pretending he has wings to flap. Until--oops--the penguins drop through the ice crack into the water below, followed by the boy: "There was a COLONY of PENGUINS." Here, one begins to wonder if the book will be a series of collective nouns, and will be tempted to peek... YES! The boy is swimming underwater with "a SMACK of JELLYFISH" in the next spread. It's spectacular! In three vertical panels, the boy's leafy garment billows up when the jellyfish hoods billow up, then closes around him when their hoods close, then his cape floats all the way off his body. (It's okay, he's wearing leafy underpants as well.) Suddenly, a big blue whale swims right up under him, and the boy is sitting on her head. A whole "pod" of whales appears. The boy, now above water on the whale's head, looks quite pleased with his lofty captain's perch until the blowhole sprays, and he turns his head toward the reader as if to say, "Look what I have to put up with." The boy is quickly scooped up by a raven, which he seems pretty happy about because he gets to fly in the sky with a whole "unkindness" of them. He's less happy when he's accidentally dropped on a "formation" of rocks. Is there anything that doesn't happen in this book? The boy even joins an elephant parade, mimicking their big ears with leaves, and plays two hollowed-out coconut shells with a "band" of gorillas. In one of the most endearing animal encounters of all, the boy sits against a tree with a caterpillar on his knee. Boy and bug are eye to eye. 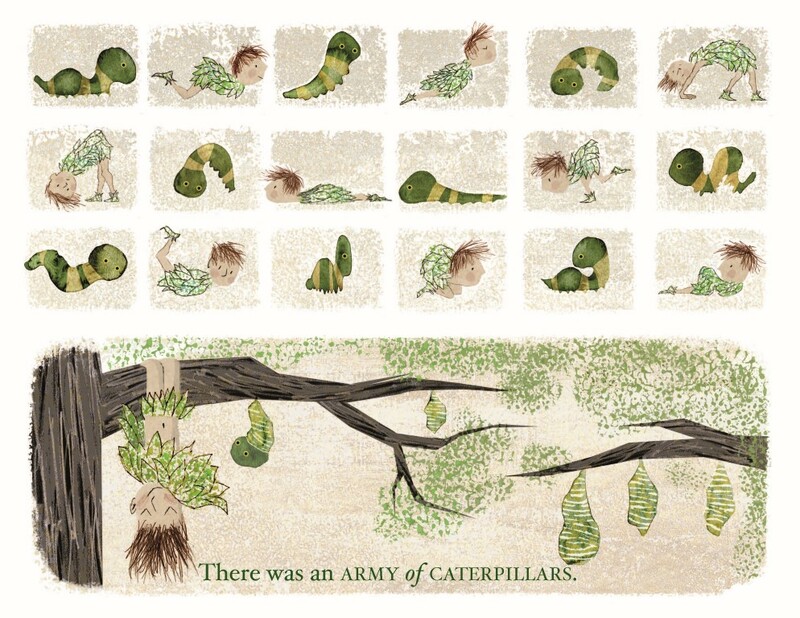 Then, in 18 postage stamp-sized frames, the boy imitates the changing shapes of the cute-faced caterpillar, involving some entertaining contortions on the part of the boy vertebrate. The boy hangs upside down from a branch with all the other chrysalises, contentedly: "There was an ARMY of CATERPILLARS." On the next page, an astonishing "flight" of butterflies has hatched, the sun is sinking, the sky golden. When the boy heads for the ocean and night falls upon the seashore, there's a "sprinkle" of lightning bugs and a "family" of stars, a "bed" of clams and a "night" of dreams. Does the boy dream it, or is there really a "trail" of shells that leads to... a "tribe" of kids? Human kids! The tribe of kids, frolicking in and around a giant tree, looks like Peter Pan's Lost Boys, except there are girls, and everyone is dressed in eclectic leaf garments similar to the boy hero's. Is it a homecoming for the boy... or a discovery? Either scenario is cause for giddiness, along with some clever pantomiming of the boy's adventures and more hugs, too. 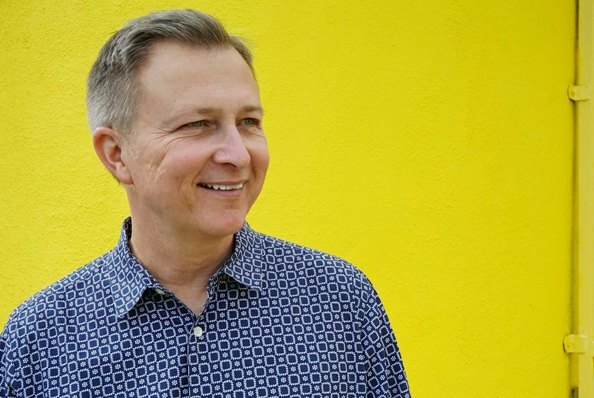 Lane Smith was named by the Eric Carle Museum as a Carle Artist for "lifelong innovation in the field of children's picture books," and in 2014, he received a lifetime achievement award from the Society of Illustrators. He's also won Caldecott Honors for The Stinky Cheese Man and Grandpa Green. Smith lives in the wilds of Connecticut, where he works out of his one-room-schoolhouse studio, a large field away from the carriage-house studio of his wife, Molly Leach, who designs all of his books, including There Is a Tribe of Kids (Roaring Brook/Macmillan, May 3, 2016). Here, Smith answers some questions for Shelf Awareness about collective nouns, children's book heroes and radishes. How did There Is a Tribe of Kids come to be? The way books happen for me, and I suspect for most picture-book creators, is not all that romantic. You sit at your drawing table every day and work and noodle and pull your hair out and work and noodle some more. I've always wanted to do a book of collective nouns, but didn't want it to be only an album of illustrations. I wanted a story. So after much noodling and toiling, a narrative began to take shape. Tell us about the evolution of the book's title. I began making lists of animal groups. I saw that a group of goats and their kids was called a "tribe." I thought this could make tidy bookends, to have a Tribe of Goat Kids in the beginning and a Tribe of Human Kids in the end. Some of the collective nouns in the book seem "real" and some seem made up. The made-up ones are for the groups that have no collective noun. For instance, TURN of TURTLES is real but PILE of RUBBLE is not, only because there is no collective noun for a stack of fallen rocks. But what else would you call the aftermath of a small avalanche? For the real collective nouns, found in my resource books and online searches, there are sometimes alternative names. For instance a group of penguins is called a "colony" but it can also be a "parcel" or a "rookery," so as the author who is also the illustrator I'm naturally going with the one with the best pictorial opportunities. A CRASH of RHINOS practically draws itself. Do you ever play the game where you make up your own collective nouns? What would be a good collective noun for a group of children's book illustrators? A Flourish of Painters? A Composition of Illustrators? A Deadline of Illustrators? An Ego of Artists...? Tell us about the leafy garments of the boy hero. Was that to show he is very much part of nature and not separate from it? Yes. He's one of a long line of fiction characters with found garments: Robinson Crusoe, Peter Pan and his Lost Boys, those naughty ragamuffins from Lord of the Flies. How would you describe this boy? Lonely! He wants so badly to belong. And who wouldn't want to take him in? You can tell he's a loving kid. He keeps hugging everyone he meets. The boy imitates the animals he encounters--flaps like a penguin, swims like a jellyfish, marches with the monkeys.... Is he a part of all the animal tribes? He wants to be a part of the various tribes, any tribe or group who will accept him, but it doesn't work out for him. That is, until he meets those misfit kids on the last spread. On the BAND of GORILLAS page, there's some musical notation. Is that any particular song or are they random notes? Good eye! That is a little march. And if any lawyers are reading, one in the public domain. At one point the boy disguises himself as a turtle by putting a coconut shell on his back. Have you ever seen the video of the coconut octopus that uses a coconut shell as a disguise? Wow! That’s amazing. I had not seen that. Like that octopus, I guess I was going for the classic Tex Avery or Buster Keaton gag where a character uses a found prop to blend in. There's a lot of impish humor in Tribe, but a real sense of wonder, too. Thanks. I think you made the point with that Octopus YouTube clip that the natural world is full of wonder and humor. This is the kind of book where you see a new detail every time you look through it--for example, how the spreads connect even after a page turn, like the penguin in the jellyfish scene, or the spouting whale in the raven scene. Does this all happen at the storyboard stage? Yes. I am always trying to connect the dots. Trying to keep things clear for the reader. Also trying to add second and even third reading gags in the backgrounds of the pictures. Tell us about the FAMILY of STARS. Well, the boy is following a SPRINKLE of LIGHTNING BUGS (yes, "sprinkle" is the actual term). I went with lightning bugs instead of fireflies because that's what we call them in Oklahoma where I was born and also I didn't want to follow the previous spread of "butterflies" with "fireflies" (too redundant). So, the boy is following these lightning bugs and they light up all around his body to create a kind of faux constellation of the boy that connects with a real star constellation of a mom and a dad. It's a literal depiction of what the boy wants more than anything, to be a part of a family. Of course the lightning bugs fly away, breaking up his little FAMILY of STARS and he's alone once again. The boy goes to sleep in a bed of clams and then there's a night of dreams. Are the trail of shells, and then the tribe of kids in the tree house a dream, or are they real? Or does it matter? It's real. But I like your take, too. It could be a dream, but my thinking was a NIGHT of DREAMS was a real night of hope, a night of wishing. The boy is dreaming he'll be accepted someday and the next morning his dream comes true. So, if the tree house is real, is it the boy's old home that he'd left behind, or is he discovering a new home? That's the one thing I wanted to keep mysterious. I wanted the reader to decide. The boy is dressed like the other "lost" kids so he could be returning to his tribe or he could be a new addition to this tribe of fellow misfits. It's about longing. It's about belonging. We all want to be loved and accepted. I know, it sounds sentimental. But you know what? It is sentimental. How did you make the artwork? I basically used the same technique I've been using since The True Story of the 3 Little Pigs 25 years ago. I use multiple glazes of oil paints that I spray with acrylic varnishes. The oils and water-based varnishes react to each other, causing a mottled texture. I then build on that foundation with painted people, animals, etc. But this time I also used watercolors and colored pencils and pen and ink and gesso, then I collaged them all together. My editor Simon Boughton liked the spontaneity of the dummy so I tried hard not to get too labored with the paintings. I tried to keep it all very light and loose. Who are your children's book illustrator and/or author heroes? I have many favorite illustrators: Lionni, Weisgard, Ness, Sendak, Gorey, Charlip. But the illustrators I feel I relate to more than any others are the Provensens. Alice Provensen once said, "Unlike artists who impose their style on every manuscript, we let the manuscript impose the style on us." Boy, that's me all over. I would hope if someone looked at There Is a Tribe of Kids and It's a Book and Grandpa Green and The Stinky Cheese Man they would say they all look different but were probably all done by the same guy. In your website's FAQ someone asked, "Do you tweet?" And you answered, "Yes, when I eat radishes. I am not on Twitter however." Is this quip a reflection of your general relationship with social media? And radishes? That "radishes" line, full disclosure, was a variation of an old Groucho line about whimsy.... But, yeah, I am not a social media kind of guy. I just can't overshare like that. I prefer the days when I did NOT know everything about Ruth Krauss or Ezra Jack Keats. I really don't need to see an Instagram shot of Munro Leaf's lunch. I'm somewhat reclusive, so a perfect day for me is sitting alone in my little schoolhouse reading something like Lionni's Swimmy or sketching while listening to Staples Singers or Tex Ritter records. At the risk of sounding like an oversharer, I actually do like radishes.